"A Gift for the Rev. Mr. Marsh from S.Catlin 1743"
Each time I gaze upon the pewter inkwell that is the cornerstone of my collection, I try to envision the colonial day on which it was carved. S. Catlin really wanted to give the Reverend Mr. Marsh a gift that would hopefully survive for centuries; and it has! This article will introduce you to the men who had a special bond back in 1743 that is revealed today through this wonderful object. I have been a collector of ink bottles and inkwells for 30 years. When I first started, a dealer could point to an object and say it was once used as an inkwell, and I would buy it! I quickly adjusted that behavior and studied every book on inks I could find, my main reference being William Covill's book (Ink Bottles and Ink Wells). My collecting relationship with Mr. Covill is a cherished memory of mine. I collected fervently for two and a half years, then sold the bulk of my collection for a profit and proceeded to collection 18th and 19th century American furniture and decorative arts. This period became my main focus, although I still would look for early inkwells and bottles at all of the antique shows I attended! 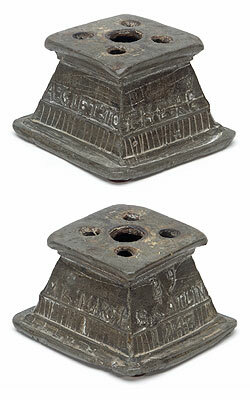 I noticed in a 1989 issue of Maine Antiques Digest an ad that included a pewter inkwell dated 1743. Imagine my excitement! However, at that exact moment, I was sitting with my mother who had been hospitalized and undergoing a spinal tap. Ouch! There were no cell phones to use. So I announced to the nurse that I was making a long distance call to Stonington, Connecticut, and to charge the call to my Mother's room. The dealer described the inkwell to me, and I bought it sight unseen. It was a tiny ad, and a tiny object in the ad, but his description was perfect. My mother recovered well, and would always just shake her head in wonder as I told her how I bought the inkwell! For years, this ink rested in the middle of my inkwell shelf, with a real antique quill. A dealer from Connecticut came to my home three years ago, looked at my little pewter inkwell, announced it was the best he'd ever seen, and would I want to sell it? I did not know the value because I had never offered it to another soul. I got busy and used the Internet to find out as much as I could about this little gem. The dealer from whom I had purchased the ink said it came right out of a home in Connecticut. So, I began my search by looking up Reverend Mr. Marsh, and taking a guess that S. Catlin was Samuel Catlin. I spent many hours honing in on the town and these two names... and here is the history of where, and by whom, I believe it was crafted. New Milford, Connecticut, Litchfield County, in 1740, was the home to several Christian persuasions. The fourth religious society in the order of time, was the Strict Congregationalist, commonly called the Separates. This sprang from earlier societies as a consequence of what is called the great revival of religion between the years 1740 and 1750. Their first elder who preached steadily there was Elihu Marsh, though he was never ordained by them. Elihu Marsh Sr. was born on June 7, 1719 in Mansfield County, Connecticut and died in New Milford, Connecticut, Litchfield County, Ct. in May 1770. Samuel Catlin was born in Litchfield County, Ct. in 1673, and died there in December, 1760. If we do the math, in 1743, Samuel was 70 when he decided to give a very special gift to the Reverend Mr. Marsh, who was, at that time, 24 years old! Side one: "A gift to"
Side two, as turned to clockwise, "the Rev"
Side three, as turned clockwise again, "Mr. Marsh"
Side four, again turned clockwise, "By S. Catlin 1743"
That is my story on my favorite ink in my collection. Needless to say, if it is every sold, I hope Samuel helps to pay for a month in the Nursing Home! This inkwell was offered in our Select Auction 157, November 6-15, 2017.